Central America is for the most part showing signs of emergence and improvement in the international market. Despite fears surrounding security, unrest and corruption, the region is making significant ground in cleaning up its reputation and is a progressively more attractive investment prospect for foreign businesses. Although much of the economy still remains heavily reliant on traditional sectors such as agriculture and textiles, exciting new trends and opportunities are springing up across the subcontinent as mirrored in the rest of Latin America. Over the next few quarters Central America and the Caribbean should continue to benefit from the booming U.S. economy, which is expected to be powered on by fiscal stimulus, at least over the short-term. As the labor market in the United States—by far the region’s largest trading partner—continues to tighten this year, remittance inflows and tourist dollars are expected to buoy household incomes across the economies within Central America and the Caribbean. Moreover, strong U.S. demand should prop up exports, which will help offset the region’s growing imported fuel bill. Regional growth is projected to reach 2.0% in 2018 and is seen accelerating to 3.8% in 2019. With that said, this article will isolate one industry of interest in Costa Rica, Guatemala, Nicaragua and Panama, respectively, providing an analysis of current numbers and movements in each sector. Costa Rica is internationally renowned for its comprehensive and profound policies towards environmental protection and conservation. The country is blessed with some of the richest natural resources on earth, with kilometers of paradisiacal coastline and vast rainforests. In recent years, it has gained global recognition for the astonishing achievement of meeting its electricity demand for over 300 consecutive days using purely green energy. The largest contributor is hydropower, which accounts for roughly 80% of all electricity produced in the country. The newly constructed Reventazón facility, which cost USD 1.4 billion to build and has a total installed capacity of 305.5 MW, is the second-largest hydropower plant in Central America, and there are plans to build a new plant with double the generation capacity. Superficially, the Costa Rican clean energy sector is very impressive; however, if you scratch a little deeper, there appears to be a significant irony and paradox, which has been highlighted by key members of the community. Dr Monica Araya, a renowned advisor and expert in the energy sector has been an particularly outspoken critic. She has illustrated that, despite 99% of electricity production sourced from clean sources, Costa Rica remains heavily reliant on oil in terms of energy consumption, especially in terms of petrol for vehicles. The country is therefore keen to invest in hybrid and electric vehicles to help rectify this discrepancy, which may provide a fantastic market opportunity for foreign investors. The Global Climate Partnership Fund is a good example of the national desire to increase the efficiency of green energy production in the country. It has a support program called “Créditos Verdes”, which provides financial lending for companies looking to invest in green projects. The inauguration of President Carlos Alvarado and the new representatives of the Legislative Assembly in May lifted a cloud of political uncertainty, which should benefit economic activity this year. However, despite ongoing legislative efforts, a high and persistent fiscal deficit will continue to weigh on prospects, as could escalated instability in neighboring Nicaragua. Our analysts expect GDP to grow 3.2% in 2018, which is unchanged from last month’s projection, and 3.3% in 2019. Boasting the largest population in Central America, Guatemala is a very attractive business jurisdiction that is often overlooked as a result of the poverty and security issues that used to plague the region. Although the country has traditionally been sustained by primary sectors of the economy, with major income sourced from the production of sugar, bananas, coffee and cardamom, the recent development of a steadily growing technology sector has provided the Foreign Direct Investment (FDI) required to advance the quality of life of its citizens and to promote economic growth. Growth in the technology sector can be largely broken down into two categories; the development of Guatemala's telecommunication sector and the surge in tech-related start-ups. Despite suffering from some infrastructural deficiencies, the country boasts “first world telecommunication infrastructure,” which has attracted nearly USD 80 million in FDI. Furthermore, and perhaps helped by being so close to the United States, the world's largest economy, Guatemala has joined other start-up giants in the region such as Chile and Mexico, and now has a reputation for being a hub for new and promising start-up projects. For example, major telecommunication service provider Telecom has invested heavily in supporting Guatemalan start-ups that operate in the technology sector, launching its business incubator “Open Futures” in the country. One example of a start-up supported by this program is Guatetrending, a social media platform that aims to facilitate networking and communication between Guatemalan entrepreneurs and small businesses. Economic growth is expected to accelerate this year on the back of strong domestic demand. A tight labor market should drive wage growth while strong remittances inflows are likely to provide a further boost to household spending. Meanwhile, government infrastructure spending should be solid. Potential political and economic uncertainty leading up to next year’s presidential elections pose downside risks, however. 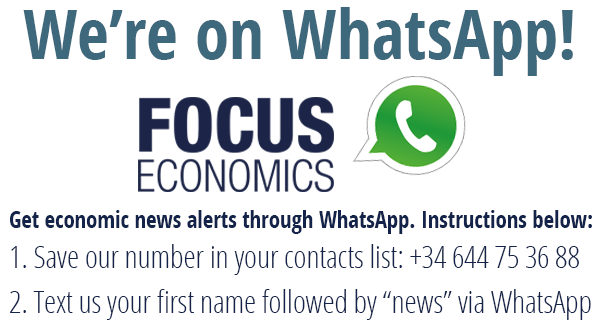 FocusEconomics Consensus Forecast panelists expect the Guatemalan economy to expand 3.1% this year, unchanged from last month’s estimate, and 3.3% in 2019. Nicaragua has made a significant effort in recent years to facilitate FDI and has passed two crucial pieces of legislation that have made the country infinitely more attractive to investors. The Tourism Industry Incentives Law provides a 10-year exemption on income and real estate tax. There are also tax-free imports on supplies and equipment for these companies. Additionally, the Foreign Investment Promotion Law was enacted, as well as a host of new Free Trade Agreements with countries such as the United States, Mexico and South Korea. Thanks to these efforts FDI reached USD 1.44 billion in 2016, according to the BCN (The Central Bank of Nicaragua). Particularly, the textile and retail production sector has emerged as one of the strongest industries in Nicaragua in recent years. The Nicaraguan Association for the Textile and Confection Industry (ANTIC) estimates that between 2016 and 2017, the industry grew by 5% and reached a market value of USD 1.5 billion. According to ProNicaragua, the government agency that promotes investment in the country, an increasingly sophisticated manufacturing sector accounted for 43.6% of the country’s exports. Nicaragua’s manufacturing sector has become particularly well-known for the production of high-quality footwear, especially leather boots and shoes. Political and social instability will weigh markedly on growth this year, although solid remittance inflows will provide some support. Our panelists expect GDP to expand 0.1% in 2018, down 0.5 percentage points from last month’s forecast, and 3.0% in 2019. Panama has become known around the world primarily, and perhaps unfairly, for providing so-called tax havens. However, there is a little-known side of Panama’s economy that dispels this stereotype: 80% of Panama’s GDP is service-based, among the largest in Latin America, and FDI reached USD 5.29 billion in 2017. Moreover, during the period of 2004-2013, the economy grew at an impressive average rate of 8.3%. The most eye-catching development in the Panamanian market is the astounding expansion and investment in infrastructure. In 2015, the government announced a four-year investment plan worth USD 20 billion, with 55% being funneled into social infrastructure. Projects include a USD 6.4 billion expansion of the metro line, as well as the building of 5,000 homes, schools and hospitals. Perhaps the most high-profile project was the USD 5.2 billion expansion of the Panama Canal, which will become the largest port in Latin America. This has understandably allowed for huge involvement from foreign construction companies, due to the astounding number of contracts being handed out for the various projects, with companies from Brazil, the UK, the U.S. and Spain all boasting large amounts of business because of the infrastructure investment. The four markets detailed above are just the tip of the iceberg in terms of business opportunities in Central America. The entire region is experiencing a period of growth and signs point to continuous prosperity in the future. Biz Latin Hub is owned and managed by an experienced team of local and expatriate professionals, dedicated to assisting our clients in navigating their way through the complexities of the Latin American business environment. We are a market leader in helping both local and foreign companies to do business successfully in Latin America, by providing a full suite of multi-lingual commercial representation and back-office services.